Is e stàit Ghearmailteach a tha ann an Sagsainn-Anhalt (Sachsen-Anhalt sa Ghearmailtis, Saxony-Anhalt sa Bheurla). Tha Magdeburg, ann am meadhan na dùthcha, na phrìomh-bhaile. Tha Sagsainn Iosail san àird an iar air Sagsainn-Anhalt, agus Brandenburg san àird an ear. Anns an àird a deas tha Thüringen agus Sagsainn. Chan eil tòrr bhailtean mòra ann an Sagsainn-Anhalt; chan eil ach na dhà anns a bheil còrr is 200.000 luchd-àiteachaidh. Is e Halle (Saale) (237.198) ann an àird an earra-dheas na dùthcha am baile as motha. Anns na meadhan-aoisean bha Halle (Saale) ainmeil airson malairt le salainn. 'S e Oilthigh Halle-Wittenberg aon de na oilthighean as sine air feadh na Ghearmailt. Tha Magdeburg (229.126) ann am meadhan Sagsainn-Anhalt na phrìomh-bhaile. Tha caisteal mòr ann, dà oilthigh, agus tha easbaig Caitligeach agus easbaig Pròstanach a’ fuireach an-sin. Dessau-Roßlau (78.360) anns an àird an earra-dheas, le Wörlitzer Gartenreich   (sa Bheurla: Garden Kingdom of Dessau-Wörlitz). Tha tòrr lùchairtean agus liosan brèagha ann. Cuideachd tha Bauhaus Dessau ann, oilthigh ailtireachd cliùiteach a chaidh a thogail le Walter Gropius ann an 1926. Lutherstadt Wittenberg (48.972) anns an àird an ear, le taigh Mhàrtainn Lùtair, taigh Mhelanchthon, Eaglais a’ Bhaile agus Eaglais a’ Chaisteal, far an do chuir Lùtair na 95 argamaidean an-àrd air an doras. Lutherstadt Eisleben (24.243) ann an àird an earra-dheas na dùthcha. Is e sin an t-àite far an do rugadh agus far an do chaochail Màrtainn Lùtair. Quedlinburg (22.607) anns an àird an iar, le seann-bhaile agus 1200 seann taigh a chaidh a thogail ann an sia linntean eadar-dhealaichte. Schönhausen (2.314) Àite bheith Otto von Bismarck. Is e Aschersleben (26.112), ris an canar geata don Harz, am baile as sine ann an Sagsainn-Anhalt. Chaidh a bhonn-stèidheachadh ann an 753. Faisg air na beanntan Harz tha Stendal (37.137), le togalaichean agus eaglaisean ann an stoidhle Backsteingotik (clachan a rinneadh à criadh-loisgte ) agus Wernigerode (29.627), far am bi trèana-smùid chun a' Bhrocken a’ tòiseachadh. Tha lùchairt ann cuideachd ann an stoidhle romansach coltach ri Neuschwanstein. Tha Naumburg (29.627) ainmeil airson àrd eaglais “Naumburger Dom St. Peter und Paul” le ceithir stìoballan. Chaidh tòisicheadh air togail a' chathar-eaglais seo ann an 1213. Tha Merseburg (34.581) agus Wolfen (24.908) cudthromach airson gnìomhachais cheimigich. Faisg air Magdeburg tha an crois rathaidean-uisge Magdeburg as motha ann anns an Roinn Eòrpa. Is e an ceangal eadar an Iar agus an Ear, eadar an Abhainn Rhine agus an Abhainn Oder. Tha am Mittellandkanal a’ dol air drochaid os cionn an Abhainn Elbe. Tha iad ceangailte ri chèile le dorsan-uisge. O chionn ’s gu bheil an talamh math airson àiteachais, tha 21% den mhalairt ceangailte ri gnìomhachas biadh agus deoch. Mar eisimpleir: Tha Kathi Bäckereierzeugnisse ann le stuth measgte airson bèicearachd, Rotkäppchen Sektkellerei agus factaraidh isbeanan Halko, a cuir isbeannan ann an canaichean airson a’ chiad turas. Is e Halloren am factaraidh seòclaid as sine anns a' Ghearmailt. Tha gnìomhachas ceimigeach a’ fàs nas motha gu math luath (17% den mhalairt). Tha trì pàircean ceimigeach ann ris an canar Mitteldeutsches Chemiedreieck eadar Halle, Merseburg agus Bitterfeld/Wolfen. Tha companaidhean-gnothachais eadar-nàiseanta mar BASF agus Thyssen Krupp an-seo, m.e. tha an Aspirin a tha ainmeil air feadh an t-Saoghal a’ tighinn à factaraidh Bayer ann am Bitterfeld. Tha tòrr chosnaidhean ann an saothrachadh rubair agus plastaig cuideachd. Tha mèinneadh ann le gual donn agus gas nàdarrach. Tha roinn na turasachd gu math làidir cuideachd, gu h-àraid turasachd cultarach. Le bailtean ceangailte ri Màrtainn Lùtair, le tòrr àiteachean a tha air an dìon leis an UNESCO mar dualchas na cruinne, le taigh Händel neo Straße der Romantik (rathad na Romansachd) tha mòran ann as fhiach fhaicinn. B’ e treubhan gearmanach a bha anns na Sagsannaich. Bha iad a’ fuireach eadar taobh an Ear na h-Òlaind agus Sagsainn-Anhalt. Bha na Sasainnich fo eagal orra, o chionn’s gun robh iad nan spùinneadair-mara. Chuir iad taobh deas Shasainn fo smachd. 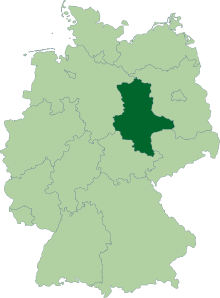 Thàinig cuid ainmean-àite bhon àm seo, m. e. Wessex (Westsachsen, Sagsaich an Iar) Essex (Ostsachsen, Sagsaich an Ear) agus Sussex (Südsachsen, Sagsaich a Deas). Thàinig ainm Sasainn fhèin airson England bho na Sagsannaich cuideachd. Anns na Sachsenkriege 768-814 (Cogaidhean nan Sagsaich) chuir an t- Ìompaire Tearlach Mòr Sagsainn fo smachd. Bhon uair sin bha Herzogtum Sagsainn ann a bha na phàirt de dh’Ìompaireachd Naoimh nan Romanach. Bha Diùc Heinrich à Sagsainn na chiad rìgh Gearmailteach (912-936) agus ghluais an cumhachd poileitigeach bhon Rhine chun an Elbe. Fon Ìompaire Otto I (936-973) à Sachsen dh’fhàs am baile Magdeburg ainmeil agus beartach gus an deach àrd-easbaig Mhagdeburg a steidheachadh an-sin. Ach ann an 1180 chaidh an Herzogtum Sagsainn tùsail air a bhriseadh. Aig àm an Ath-Leasachaidh (1635) dh’atharraich an àrd-easbaig Mhagdeburg don Herzogreich Sagsainn. Bho 1680 bha e pàirt den Bhrandenburg-Pruisia. An dèidh cogadh Napoleon (1815) chaidh Herzogtum Magdeburg, Altmark, rioghadh Westphalen agus pàirt den Sagsainn a chuir ri chèile mar sgìre pruiseach na Sagsainn (1815-1944). Is ann aig an àm seo a dh’fhàs muinntir nan sgìrean diofraichte ri chèile, gu h-araid anns a’ ghnìomhachas. Ach ann an 1944 bhris an sgìre Sagsainn as a chèile. Bha an sgìre Anhalt bhon 11 linn aig a’ chinneadh uaisle Askanier. Ann an 1871 chaidh iad a-staigh ri Deutsches Reich agus ann an 1918 bha iad mar saor- stàit anns an Weimar Republic. An dèidh an darna cogadh chuir na Ruiseach Anhalt agus sgìre Sachen ri chèile, ach aig àm DDR cha robh dad ann ach dà sgire Halle agus Magdeburg. Ann an 1990, an dèidh aonadh na Gearmailt, chaidh ath-nuachadh na stàite mar Sachsen-Anhalt le Magdeburg na phrìomh-baile. Air an lùireach chithear samhladh Pruisia (suas) agus samhladh saor-stàit Anhalt (sios). Ann an àirde tuath Sagsainn-Anhalt bruidhnear „Anhaltisch“. Is e Thuringian dual-chainnt(Upper Saxon German sa Bheurla) a th’ ann. Tha i coltach ri Ard-Ghearmailtis oifigeal, ach le faclan agus abairtean sònraichte a thàinig às a’ Mhark-Brandenburg. M.e chanar „ick“ an àite „ich“. Anns an Deas agus timcheall air Mhagdeburg cluinnear Altmärkisch am measg nan seann-daoine, cànan a tha ceangailte ri Ostniederdeutsche Sprache (East Low German sa Bheurla). O chionn’s gu bheil deagh àiteachas ann an Sagsainn-Anhalt, tha feòil de gach seòrsa agus glasraich cudthromach airson biadh a chuir ri chèile.M. e.: Altmärker Hochzeitsuppe (brot-bainnse à Altmark): Is e brot feòil-circe a th’ ann le glasraich, piòsan muic-fheòil measgte, uighean agus asparag. Ann am Magdeburg ithear „Bötel mit Lehm und Stroh“ (cas le crèadh agus connlach). Is e cas-muic le peasraichean measgte agus càl geur a th’ ann. Ach uaireannan tha dòighean còcaireachd ann a tha rud beag neonach. M.e. Is e rìs milis le isbeanan biadh coltach ann an Anhalt. Tha Salzwedel cliùteach airson Baumkuchen (ceic-craobh). Canar gun tàinig an doigh-bèicearachd le luchd-siubhail às an Ungair anns an 16mh linn. Dh’fhàs am Baumkuchen ainmeil, nuair a bha rìgh Pruisia Frederick William IV ga ithe ann an turas tro Sagsainn- Anhalt (1841). Is e mìn, ìm agus uighean a th’ innte ann an dòigh 1:1:2, agus is dòcha mil neo cnò neo Rùm. Tha a’ cheic air a dhèanamh air bior-ròstaidh os cionn teinne. Cuirear linnich na taois air a-rithist agus a-rithist, gach tè a’ bèicearachd gu curamach. Mar sin mairidh a’ cheic ùr airson uine fhada. Mu dheireadh cuirear seòclaid timcheall oirre. An-duigh is urrainnear a’ cheic à Salzwedel a cheannachd air feadh an t-Saoghal. Ann an Würchwitz gheibhear Milbenkäse (caise-fineag). Cleachdar meanbh-chruimh (Tyroglyhus casei L.) shònraichte airson abachadh an àite lobhadan. Ithear na meanbh-chruimh còmhla ris a’ caise agus tha blas a’ chàise rud beag searbh. Ach ann an 1970 bha e coltas gum bi an traidisean gu bhith marbh. Cha robh ach caileach a-mhàin ann aig an robh fios mun dòighean traidiseanta airson a’ chàise a dhèanamh. Gu fortuanach bha uidh aig Helmut Pöschel, neach-teagaisg à Würchwitz, airson dòigh beatha meanbh-chruimh agus thoisich e gan àlaich a-rithist. An-diugh tha taigh–tasgaidh beag ann mu eachdraidh agus dòighean tradiseanta caise-fineag. Tha an Kulturhistorisches Museum ann am Magdeburg annasach airson eachdraidh Mhagdeburg agus na Gearmailt. Is e siubhal tro na linntean a tha anns an taisbeanadh seo. Tha iad ag toiseachadh le àm Thearlaich Mhòir agus Otto der Große. Tha pìosan ann bho na Meadhan-Aoisean, bhon Ath-Leasachadh, bhon chogadh airson 30 bliadhna, Pruisia, an Darna Cogadh agus àm DDR. Tha cruinneachadh le 2000 dealbh ann an Anhaltische Gemäldegalerie  (taigh-tasgaidh le dealbhan) ann an lùchairt Georgium ann an Dessau. Thàinig na dealbhan às a’ chinneadh Oranien agus Askanien. Mar sin tha ealainn ainmeil às an Olaind, às a’ Bheilg agus às a' Ghearmailt bhon 16mh linn gu 19mh linn rim faicinn an-seo, gu h-araid bho àm Dhürer agus Ghoethe. M.e. tha dealbhan le Lucas Cranach, Rubens agus Breughel ann. Tha mòran taighean-taisgaidh ann am Wittenberg mu bheatha Màrtainn Lùtair, am measg an taigh far an do rugadh e agus an taigh far an do chaochail e.  Is e taigh Mhelanchthon aon de na taighean as brèagha ann an stoidhle Renaissance. Chaidh a thogail ann an 1536 agus tha e ann fhathast gun mòran atharrachadh. Tha tòrr fiosrachaidh mu flùranach, ainmhidhean, agus eòlas-talmhainn ri fhaighinn ann an Harzmuseum Wernigerode taigh tasgaidh Harz. Tha an Technik Museum „Hugo Junkers“  (taigh-tasgaidh teicneòlas) ann an Dessau a’ sealltainn eachdraidh teicneòlais agus adhair-sheòladh bhon 20mh linn, gu h-araid H. Junkers mar tùsair adhair-sheòladh. Tha am pleana „Ju52“ ri fhaicinn an-seo cuideachd. Is e cuairt air feadh Sachsen- Anhalt a th’ ann an Strasse der Romantik  (rathad na Romansachd). Chìthear togalaichean às na Meadhan-Aoisean, eaglaisean anns na bailtean beaga, àrd-eaglaisean, caistealan, luchairtean, taighean agus bailtean bhon àm 950 gu 1250. Ann an àrd-eaglais Mherseburg tha na Merseburger Zaubersprüche (dàn-draoidheachd à Merseburg) rim faicinn. Fhuaradh iad ann an 1841 ann an leabhar creidheimh às an 9mh/10mh linn, far an robh iad sgrìobhte air duileig shaoir. Dh’ fhàs iad ainmeil, o chionn’s gu bheil iad nam fianaisean creideimh ana-crìosdaidh ghearmanach as sine ann an seann àrd-Ghearmailtis. Ann an 1999 fhuaradh an Himmelsscheibe von Nebra,(clàr-adhair Nebra, sa Bheurla Nebra sky disk), pìos metailt à 1600 r.C. Is e iomradh mionaideach den adhar as sine air feadh an t- saoghail. Is urrainnear làithean mar leth a’ gheamhraidh agus Fèill Eòin a mhìneachadh. Chan eil an rannsachadh deiseil fathast, ach dh’ fheumtadh tòrr fiosrachadh a bhith ann aig an àm seo mu reul-eòlas agus gluasad nan rionnagan agus an ceangail ris a’ bhliadhna. An-dràsda tha an clàr-adhair ri fhaicinn ann an taighean-taisgaidh air feadh na Roinn Eòrpa, ach thèid taigh-taisgaidh a thogail ann an Nebra ann an 2007. ↑ www.woerlitz-information Duilleag oifigeal "Wörlitz Park"
Air a tharraing à "https://gd.wikipedia.org/w/index.php?title=Sagsainn-Anhalt&oldid=506518"
Chaidh an duilleag seo a dheasachadh 4 dhen t-Samhain 2015 aig 21:26 turas mu dheireadh.